Mutsy... is a happy, sweet, friendly and slightly insecure, big, cookies and cream speckles and spots.. goofball. He is essence of MUSH.. loves to get loved on, gives major love gaze .. even does the slow to open love blinks, enjoys body contact, has a soft gentle mouth, fancies sweet little dogs.. and is very careful with them.. we think he thinks hes a wee doggie himself! LOL!!! He arrived to us a complete KLUTZ with no idea of leashes and manners.. NOW.. he is a really easy, well mannered farm dog who is MORE than ready to go to go home with his forever family! Mutsy has rocked his training and totally gets how to go politely walking with humans on a leash, hes tuned in to all sorts of cues like sit , look, come, lay down, touch.. During his time here he's learned that there are humans who not only understand dog language but are actually interested in what he has to say! Mutsy is a relationship dog.. friendship is important to him... He is attentive, smart, engages easily, picks up on new ideas quickly, enjoys learning and adventure! Mushball Muts is a wonderful combination of sweet and cuddly, hang out loungey on the couch, roll around in the grass lover and super hero action figure ..ready for fun, ball chasing, game playing, hike the hills mate ! Mutsy is hilarious to watch during his free play time ... he falls in love with certain toys and carefully carries them around is his mouth all day moving from one location to the next... like it's his little baby... now and then he'll drop them as if he's lost interest only to.. in his cat-like movement.. ambush & pounce on them .. so funny! Mutsy needs a happy, easy going, relaxed human companion....he's rather sensitive and extremely cooperative. He's a pleaser and could be easily be hurt.. ( seems the big dogs are always so tender hearted!! He is actually afraid of our office, Chi Queen Darla!! All she has to do is lift her lip or shoot a glare and Mutsy runs away! ) So for Mr M. someone who would always feel his inherent goodness & innocence and would totally understand that if he ever made a mistake.. thats all it could ever be .. a mistake.. He tries so hard to do the right thing.. the fun thing.. He is very sincere! We recommend Muttsy go to a home with children aged 14 and up. ​Update from Dog Trainer Jamie - Muttsy is one of my favorites to work with (Shhh...don't tell the others!) He is so eager to please and loyal. He 100% trusts me and I trust him. DOESNT GET ANY BETTER THAN THAT!!! 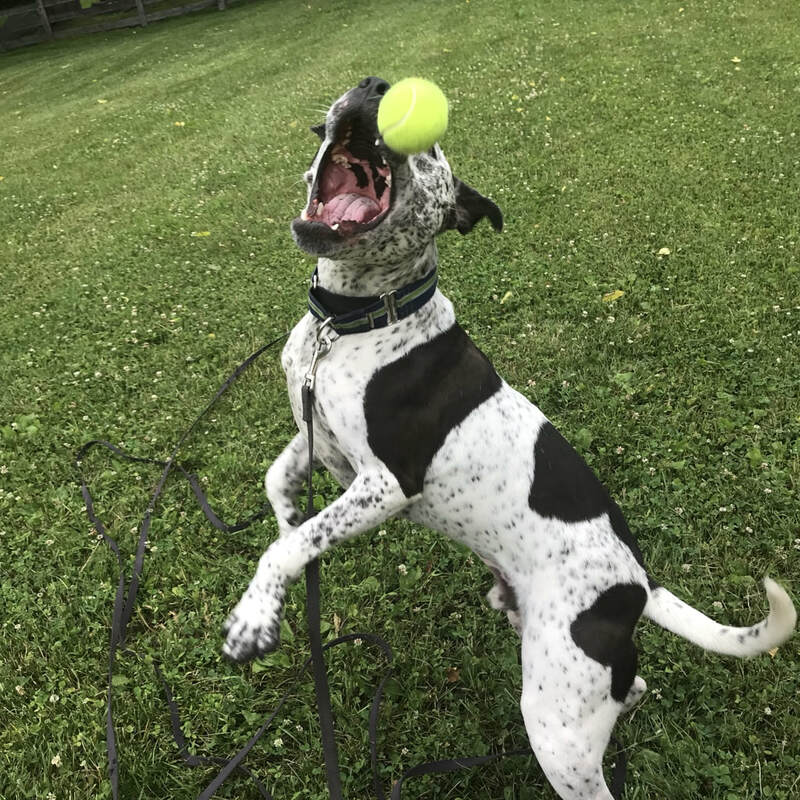 It will be important for his new home to build trust with him through fun games and happy exercise! He is perfect for someone would enjoy growing ever closer with a dog while allowing him to see the world one step at a time. He's a real gem! Scroll down for more info, videos and photos!! Muttsy’s greeting style is fully dependent on who he is greeting! When saying hi to someone he knows and trusts Muts will shower them with LOVE! He gets super wiggly and bursts with joy… so grateful for any attention. He gives a loving gaze into your eyes and sweet little licks under your chin. He is endearing, gentle and is fully present in the moment with you. He is the most precious guy! Upon greeting someone he doesn’t know yet…basically if you’re cool he will be too! He has met a bunch of new volunteers and loves them all instantly. However, if he is approached with too much intention or perhaps hesitancy he will certainly feel it! The imbalance coming from the hesitant person causes him to think there is something he should be worrying about and he may keep his distance until trust is made. Muts can be a tad insecure and needs confidence to surround him. Muttsy can become easily overwhelmed, especially with consistent unpredictable comings and goings with people he hasn’t grown a bond with. We feel a home with young children will have too many uncertainties for him. Muttsy will do best in a home where he can be a priority. Mr. Mutts LOVES little dogs! He is so gentle with them and will even lay on the floor to even the playing field. He became loving, fast friends with three puppies we had some months ago… you can see in his pictures! Mutts gets along better with sweet females then he does males. He tends to go into “challenge” mode with big time, assertive male dogs. We have seen him get along with males though! He is best friends with our very own Rockford! In short, Muttsy seems to prefer playful, confident energy when interacting with other doggies. Muttsy sees a cat as a fun game of chase rather than a sweet furry companion. No cats for him! When Muttsy first came to us he has was borderline out of control on the leash and had zero boundaries. He would pull on the leash, bark at horses and even get too playful and mouthy with his handler! He quickly went into Dog Trainer Jamie’s “boot camp” obedience program and took to the training like a fish takes to water! Muttsy is BRILLIANT. He learned proper leash manners, how to settle down during high energy situations and to completely put trust into his handler. A walk with Muttsy now is so peaceful. He is a very present dog and stays in tune with his trusted handler. He will happily walk alongside, equipped with his easywalk harness on a nice loose leash. Muttsy will continue to check in by looking up and making eye contact. If you stop moving, he will automatically sit and look up at you. What a dream! Of course, whoever is lucky enough to adopt this special boy will have to learn simple leash techniques to keep up with Muttsy’s training.